(Hebrew) Azazel, god/demon of war. This demon is also a demon of the desert. 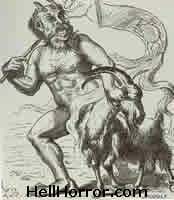 He also appears in the form of a billy-goat and is the leader of the Mala"ak (fallen angels, compare: Lucifer). Azazel also means scapegoat. Fallen angel whose name means "God strengthens". The Azazel fallen angel is a male fallen angel.